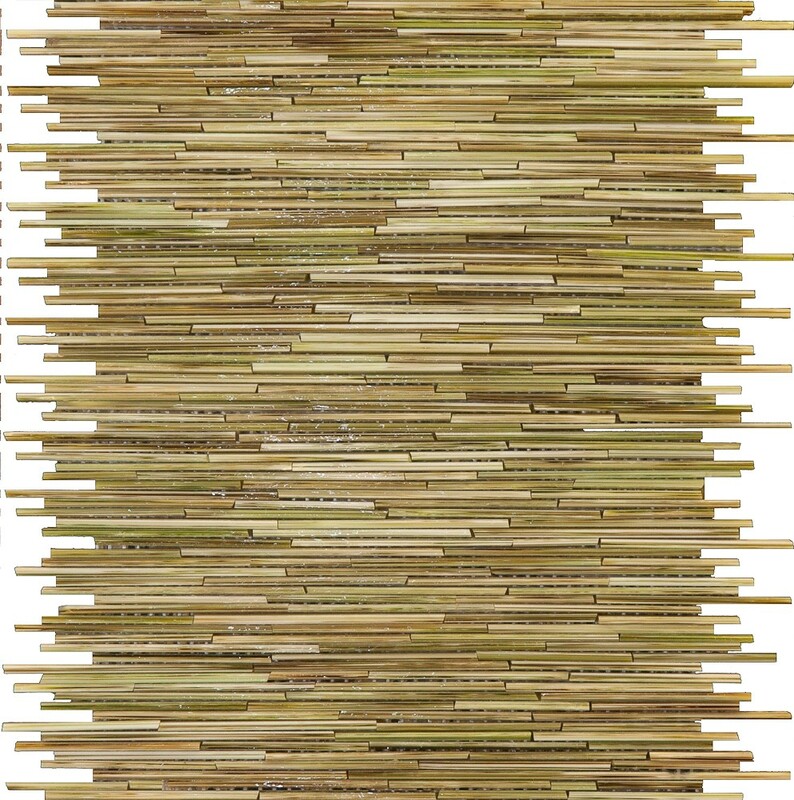 I love discovering new green design products. In online newsletters, magazine ads, trade shows and unsolicited samples in my mailbox, I am always on the lookout for the latest in green technology, creativity and beauty. I would like to share some of the promising products that have crossed my path recently. Some of them have just come on the market, and some of them are just new to me (and I hope to you). Caveat #1: The information that I have about the products is based on the manufacturers' literature and their sales reps' answers. Caveat #2: I have not personally used any of these products in a design, so I don't know whether or not they will perform as their manufacturers say they will. All of that said, here's the cool stuff. Cosentino is well known for its Silestone engineered stone counter tops that are made of quartz chips and a binder. In 2014, Cosentino released Dekton, a revolutionary product that presses quartz, porcelain and glass into slabs using what Cosentino calls a Particle Sintering Technology (PST). The process applies 25,000 tons of pressure and then bakes the product at an extremely high temperature to mimic the metamorphism or change in form that rocks undergo over the centuries in nature. Talk about a big vision. 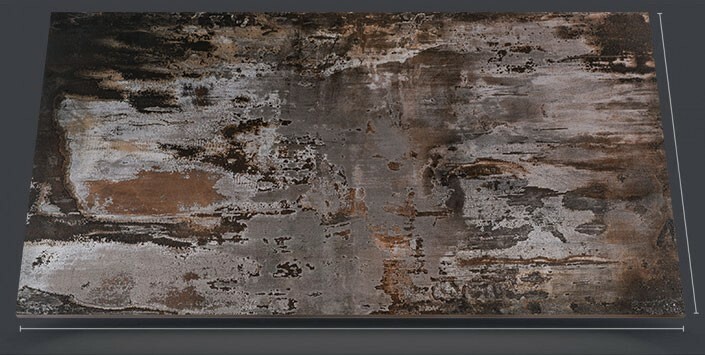 This year Cosentino released its first Dekton product that includes recycled content. On top of having 60% recycled content, Trilium from the Tech Collection is a beautiful surface material that looks like gray slate seductively splotched with rust. Because it is available in .8 cm thickness and 126" x 56" size, the Trilium product can be used as a solid surface wall covering for showers - without the grout lines of tile! Dekton also can be used for counter tops, siding, facades and flooring. 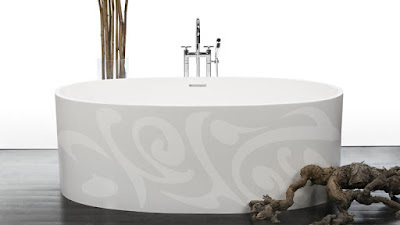 Wetstyle, a manufacturer of bathtubs, lavatories, sinks and bathroom cabinetry, has completely abandoned porcelain and developed its own eco-friendly, thermo-insulating material called Wetmar Bio, which is made primarily of soy and mineral stone. They also have developed a soy and vegetable extract sealant to replace the petroleum-based resins that are used in standard porcelain bathroom fixtures. Petroleum products off gas toxic volatile organic compounds (VOCs). Wetstyle's bathroom products are not just sustainable but stylish. The back splash tile above the vanity in a bathroom or a powder room is essential to establishing the room's design and style. The color, shape and patterning of the tile can create anything from a sense of whimsy to a feeling of elegance. Happily, there are many beautiful recycled glass and porcelain tiles in different shapes, colors and patterns to create a palette of designs. Unique Building Products has a truly unusual and beautiful tile series. The Bleeker Street collection is made of small pieces of glass upcycled from broken stained glass. The rectangular pieces of glass have been glued together to create an irregular running brick pattern. The depth of the glass pieces are a quarter of an inch, more or less, so the surface is uneven rather than smooth although it isn't sharp. I'm going to remodel my bathrooms this year, and I'm considering the Bleeker Street Green Blend for my master bathroom vanity back splash although a little voice keeps whispering, "You know it will collect dust...." The other little voice says, "But it would be perfect with the Vetrazzo recycled glass counter top you want to use." I expect to find out which little voice wins by the end of the year. I'll let you know. One of my former clients called me this week because she has moved across the country and wants to paint her new home in some of the same colors that we selected for her Tucson home a couple of years ago. After I emailed her the paint schedule for her former home, she mentioned that she was replacing all the carpet in her new home. I emailed her a tip on which green carpet certification to use to select a healthy carpet, and I'm glad that I did because the carpet salesperson my client is dealing with told her that none of their synthetic carpets off gas toxic chemicals, which is impossible. Carpets that are made of synthetic fibers like nylon, polyester, polypropylene (olefin) and acrylic are petroleum products. Petroleum off gases volatile organic compounds (VOCs). VOCs are carbon-based compounds that evaporate easily when they are exposed to the air. VOCs are the source of the "new paint," "new carpet" and gasoline smell. Carpets also have fire retardants, which are very toxic, and they have semi-volatile organic compounds (SVOCs). SVOCs are carbon-based compounds that only partially evaporate when exposed to air, so they leave toxic microscopic particles behind. Some VOCs persist even after that new carpet smell is gone, so it is not enough to simply air a carpet out before installing it or to not occupy the house right after the carpet is installed although both of those things are good ideas. If you are going to buy a carpet made of synthetic fibers, the best thing to do is to buy one that carries a Green Label Plus certification. This certification means that the carpet has reduced levels of VOCs. The certification must include the "Plus" since a standard Green Label certification does not require very high standards for its products. Also, it is important to get a carpet pad that has a Green Label Plus certification. The Green Label certifications were developed by the Carpet and Rug Institute, which is why they include the initials CRI. While the CRI is a trade organization of carpet manufacturers, the testing for certification is done by a third party, so it is a reputable, non-biased certification. Even a Green Label Plus certified synthetic carpet will off gas because it is a petroleum product. For someone with multiple chemical sensitivities or a compromised immune system or for someone who wants the healthiest carpet on the market, I recommend a wool carpet although they are very expensive.Wool is a natural product (thank you, sheep! ), and it does not inherently off gas chemicals. Because wool is naturally fire resistant and stain resistant, wool carpets do not have fire retardants or stain protectors added. Some wool carpets do have added moth proofing, so I recommend asking the flooring retailer about that and avoiding it. Wool carpets also will last a long time - think of the 19th century wool rugs that are still around. There are some people who are allergic to wool for whom a wool carpet would not be suitable. Whatever kind of carpet you buy, be sure and maintain it by vacuuming it regularly using a HEPA vacuum cleaner. This type of vacuum cleaner uses a high-efficiency particulate arresting (HEPA) filter that captures minuscule particles of dust and pollen that can aggravate allergies and asthma. All of that said, I really don't recommend carpeting. If you have ever pulled up an old carpet and seen the accumulated dirt, dust and disintegrated carpet pad under it, you know why. Also, most people can't afford a wool carpet, so they are stuck with an ongoing source of off gassing VOCs (their new synthetic fiber carpet). Do you want to step out of bed onto a warm, soft surface in the winter? Do you want a soft surface in the nursery where you can sit on the floor and play with your baby? Install a hard flooring surface - tile, wood, cement, cork, bamboo, linoleum - and put down a large rug. That way you can periodically pull up the rug, shake it out or send it to the cleaners and clean the floor under it. When it comes to health, selecting carpet is definitely a choice between bad, better and best, which is to say non-certified synthetic carpet, certified synthetic carpet and wool carpet. You're probably wondering, "So how much more is this going to cost me?" Depending on where you shop, the answer could be "Not a dime more." Last month when I was in a big box hardware store looking at carpets for my mother-in-law's home, of course, I checked to see which carpets were Green Label Plus certified. The store sold only one brand of carpets, its house brand, and they were all Green Label Plus certified, and so were their carpet pads. 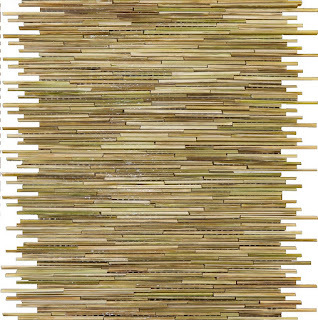 Green carpets are going mainstream, but be sure that you read the label, and make sure it's the right shade of green.